At the American Legislative Exchange Council  (ALEC) 2015 annual meeting in San Diego, California, dirty energy companies and their supporters--including ExxonMobil, Chevron, and Duke Energy--continue to dominate the funding of activities, according to a list of conference sponsors obtained jointly by the Center for Media and Democracy and Greenpeace. After Google chairman Eric Schmidt accused ALEC of "literally lying" about climate change on NPR in September 2014, a fleet of companies ditched ALEC , from oil giants like BP and Occidental Petroleum to software and tech firms like Facebook, Yelp, Yahoo, AOL, eBay, and SAP--the company which chaired ALEC's corporate board. 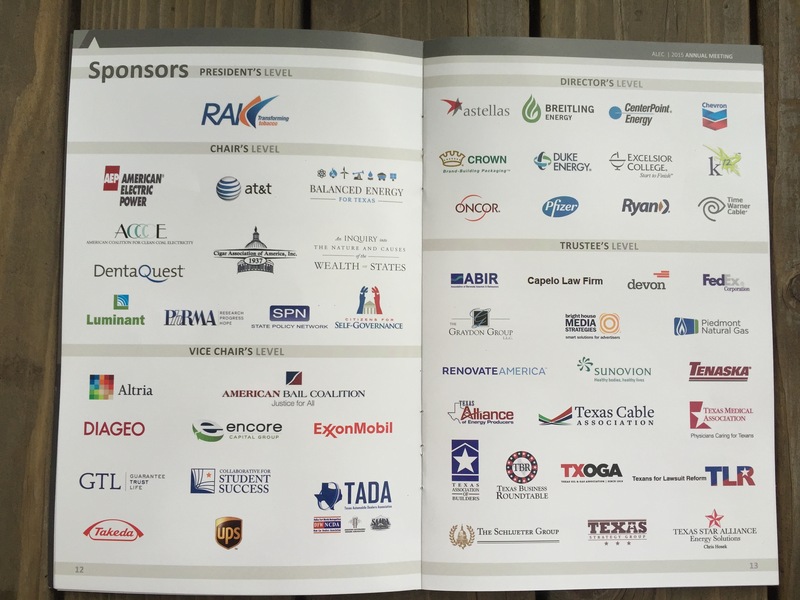 For the full page of corporate logos sponsoring the ALEC conference see here .